About the book: The celebration of network cultures as open, decentralized, and horizontal all too easily forgets the political dimensions of labour and life in informational times. Organized Networks sets out to destroy these myths by tracking the antagonisms that lurk within Internet governance debates, the exploitation of labour in the creative industries, and the aesthetics of global finance capital. Cutting across the fields of media theory, political philosophy, and cultural critique, Ned Rossiter diagnoses some of the key problematics facing network cultures today. Why have radical social-technical networks so often collapsed after the party? What are the key resources common to critical network cultures? And how might these create conditions for the invention of new platforms of organization and sustainability? These questions are central to the survival of networks in a post-dotcom era. Derived from research and experiences participating in network cultures, Rossiter unleashes a range of strategic concepts in order to explain and facilitate the current transformation of networks into autonomous political and cultural ‘networks of networks’. 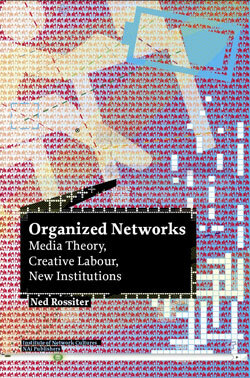 About the author: Australian media theorist Ned Rossiter works as a Senior Lecturer in Media Studies (Digital Media), Centre for Media Research, University of Ulster, Northern Ireland and an Adjunct Research Fellow, Centre for Cultural Research, University of Western Sydney, Australia.